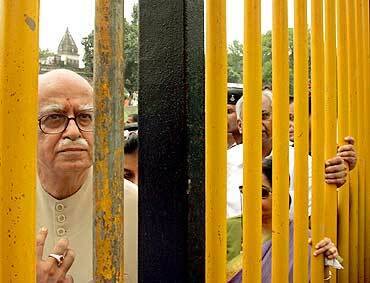 Senior Bharatiya Janata Party leader L K Advani felt 'vindicated' about his Ayodhya 'rath yatra' in the wake of the Allahabad high court verdict and preferred a negotiated settlement for building a Ram temple at the place where the makeshift now stands. He strongly endorsed his party president Nitin Gadkari's suggestion that Muslims can build a mosque 'outside the complex' in Faizabad on the banks of river Saryu. In the course of more than an hour-long interview with PTI, the BJP leader, who will turn 84 next month, was careful in his statements and did not want to appear victorious after the judgment and did not said anything that would ruffle the feathers in the Muslim community. "Yes, I do feel vindicated because I believe that until 1989 BJP was not part of this (temple) movement which actually started in 1949," he said, to a question whether the judgment has vindicated his temple campaign launched in 1989 from Somnath to Ayodhya. Replying to questions on what is the way forward and whether the BJP and Sangh Parivar would take the initiative for a negotiated settlement, Advani said, "The way forward is an agreement between the two communities that this (construction of temple at the disputed place in Ayodhya) should happen. What should happen let them work it out." Advani said so far as the judgment is concerned it makes obvious that the desire of 'those millions' who wanted a Ram temple to be constructed at what is believed to be the birth place of Ram will happen. "But it would be good if this is not just a court's decision but also the decision of both the communities together," he said. He ruled out the possibility of Allahabad high court verdict egging temple protagonists to rake up fresh issues over disputes surrounding Kashi and Mathura shrines on the ground that faith takes precedence over law. "No, no. There is a sea of difference between the two. 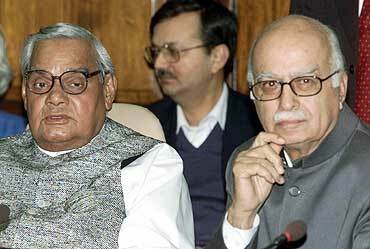 The reason for that is during negotiations (between National Democratic Alliance government and leaders of the two communities before 2004), the Hindus had categorically conveyed to the Muslim side, which had expressed such apprehensions, that since they would be voluntarily agreeing on a solution (to Ayodhya), that will not happen," Advani said. "We had talked about it then. I do not see this judgment (doing it) because, after all, Ayodhya has been an issue which has changed the political history of the country," he said. During the interview, the chairperson of the BJP Parliamentary Party and working chairperson of the NDA, did not want to go into issues whether the Allahabad high court judgment justified the demolition of the disputed structure in 1992. Nor would he comment on the issue whether the judgment dilutes the demolition case. He said he had always maintained that everyone in the movement, who was in favour of constructing the temple, never wanted to do it forcefully. "I said OK. I left around 5:30-6 pm. I came to Lucknow and sent a message to the Lok Sabha Speaker that I am resigning as leader of the opposition. And my regret is because a political party aspires to achieve anything, it seeks to achieve that by due process of law. Not forcefully," he said. 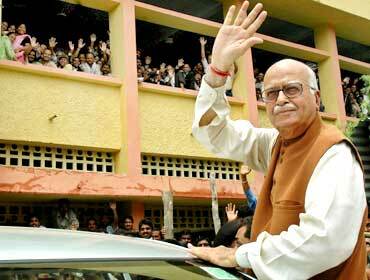 Advani recollected that in 1949 the idols of Ram were installed and the courts ordered that they should not be removed. "For a long time the doors were closed and those devotees who used to come for darshan used to do it from outside. 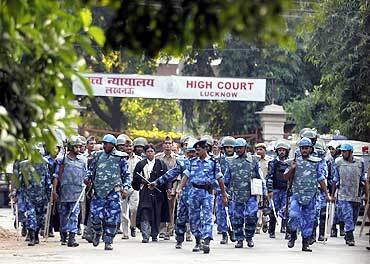 Subsequently, in Rajiv's (Gandhi) regime the doors were opened on court orders. The foundation stone of the temple was also raised under Rajiv's regime," he said. "So it has been my stand that those who want to construct a temple are not doing anything against the law. 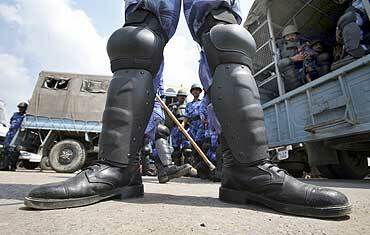 Those who are opposing it are opposing the court order," he said. 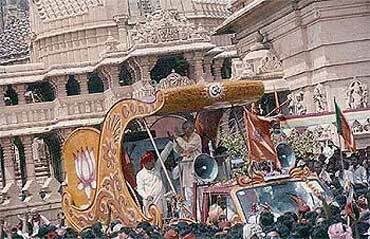 Advani said people tell him that through his rath yatra he had triggered off a debate on what is genuine secularism and pseudo-secularism. "The first time I used the word pseudo-secularism was then. Even in the early years of independence what should be the approach of a question of this kind, there were two opinions. "One, I would regard as genuine secularism. Though I believe that my word pseudo-secularism has more to do with the fact that people are concerned now-a-days about vote bank. For that they can take a certain stand," he said. Asked about the disquiet in the Muslim community about the Allahabad HC judgment which it feels placed faith above law, Advani said, "If this judgment had not been there, I would not have said that this is no longer a case of faith versus law. This is a case of faith upheld by law. I said it because of the judgment." 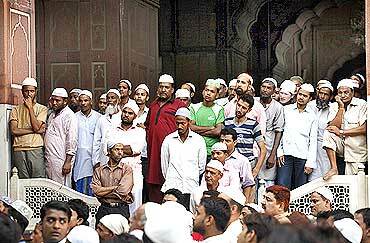 The former home minister and deputy prime minister in Atal Bihari Vajpayee government recalled that in 2004 there was a point when the Muslims wanted to withdraw their plaint in the Ramjanambhoomi-Babri Masjid case. But there was no progress on this because elections came and BJP did not come back to power. Answering a question he said, BJP and Sangh Parivar taking the initiative could be misunderstood. 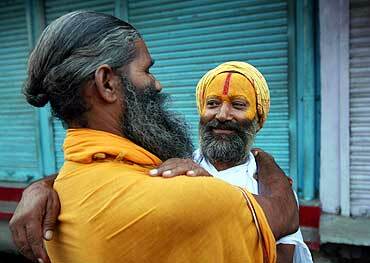 "I have already spoken to several sadhus and sants who are in contact with Muslims also. I told them you take the initiative and talk to them. They are talking to them." On Rashtriya Swayamsevak Sangh, Advani referred to the Sangh founthead's statement on the verdict and said that the judgment should become a turning point not only in the history of Ayodhya but in the relations between the two communities. "From BJP, the statement we issued the feeling was that this should become an opportunity for moving forward towards national integration," he said, adding he welcomed the Allahabad high court judgment. He also recalled what he wrote in his autobiography, "My Country My Life", on three options he felt were obvious for resolving the Ayodhya dispute -- legislation, judicial verdict and amicable settlement between representatives of the Hindu and Muslim communities. But now he felt a combination of court judgment and negotiated settlement should be best way out of this problem.